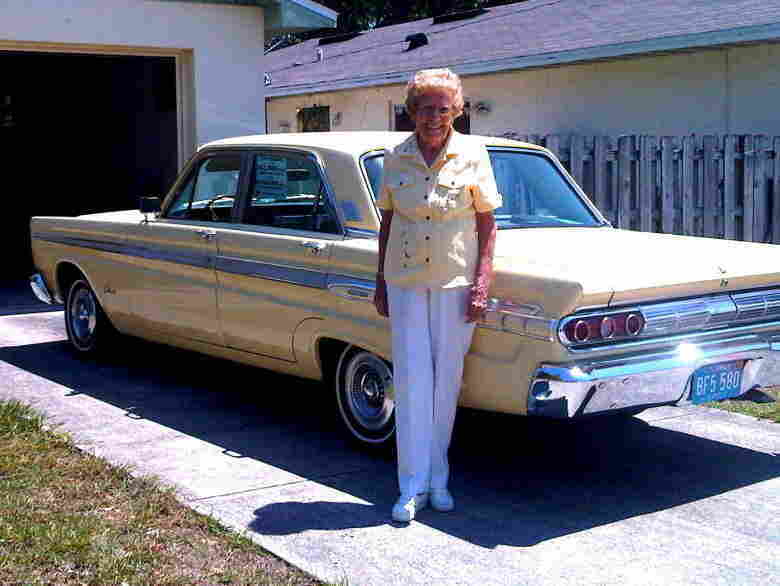 After 567,000 Miles And 48 Years, Florida Woman Parks Her 'Chariot' : The Two-Way Rachel Veitch can't drive her beloved 1964 Mercury Comet Caliente any more because of her eyesight. Her "Chariot" has been with her nearly five decades and for more miles than a trip to the moon and back. She never considered trading in the car she loves. When 93-year-old Rachel Veitch picked up the newspaper on March 10 and realized that the macular degeneration in her eyes had developed to the point where she couldn't read the print, she knew it was time to stop driving. But there's much more to the Orlando, Fla., woman's story. The decision meant she would no longer be getting behind the wheel of her beloved 1964 Mercury Comet Caliente, a car she calls "The Chariot." Veitch has pampered her ride for nearly five decades and 567,000 miles. This afternoon she told All Things Considered co-host Robert Siegel that "there's no car on this earth I would trade for my Comet." It's been, she said, the "pumpkin that turned into the golden chariot and I'm Cinderella." Chariot has outlasted the "lifetime guarantees" on three sets of shocks, eight mufflers and 18 batteries. "I'm the lifetime guarantee people's nightmare," Veitch said. The car also has been with Veitch through three husbands. Veitch says she's never considered trading Chariot in. The reason is simple: "I love my car." Now, Chariot will only make rare trips away from home. A grandson (he's 50) will be taking her to a car show in Cocoa Beach this weekend. In July, Chariot will be shipped by friends to a show in Milwaukee. Veitch will fly there. As for what happens when she's no longer around, Veitch knows one thing — she doesn't want anyone in her family to get Chariot. "No way would they take care of it like I do," she told Robert. What she would really like is for Jay Leno, who's well known for his love of cars, to add it to his collection. She was on The Tonight Show in 2010, and Leno gave her a private tour of his garages. And as for Chariot, Veitch is convinced that the car could have gone for many more miles if someone took good care of her. Veitch puts a sign in one of Chariot's windows every time she passes another milestone. "It will soon be 570,000 and I've already got the signs made for 580 and 590," she said. Much more from her conversation with Robert will be on All Things Considered later. Click here to find an NPR station that broadcasts or streams the show. We'll add the as-broadcast version of the interview to the top of this post this evening. As you can tell from her experience with Leno, Veitch is no newbie when it comes to the news media. GrowingBolder.com did a video report about her and Chariot back in 2007, when the car only had 540,000 miles on the odometer.